It’s no secret that the security industry, as with everything else, is moving towards the Internet and IP networks. Advances in this field now offer residential estates and home owners access to the latest in security technology without having to pay a fortune for hardware, installation costs or complex cable runs. But not all suppliers and technologies are equal, and it’s important to find a partner that can provide the right advice and supply the best hardware to successfully complete your solution. It’s this dedication to quality and service that sets MiRO apart from its competitors. 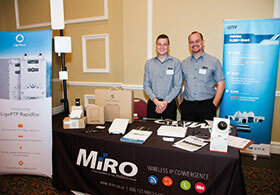 By partnering with industry giants LigoWave and Uniview, MiRO is able to provide its business partners with the best solutions for their wireless security solutions. Uniview’s IP surveillance solutions are easy to install, user friendly, feature rich and their products are of the highest quality. Their solutions include everything you’d need to set up your security network from scratch, regardless of project size. From network video recorders that can handle anything from 8 to 128 channels, switches and IP cameras with the latest on-board edge analytics and compression technology, to video management software and a free mobile app for easy management and convenient viewing options. By integrating Uniview’s IP surveillance solution with an estate’s wireless network, estate managers save on complex cable runs, over-priced hardware and installation time. LigoWave’s solutions offer carrier-grade features that are ideal for data-hungry security applications (video footage) that cover large properties. Estates can deploy point-to-multipoint topologies between the homes and guard house of a residential estate and wireless backhaul from the guard house to a remote monitoring site. Not sure how these solutions will work for you? Contact your nearest MiRO branch where MiRO’s sales staff can provide you with advice on what solution would suit your project best.